You can click on the picture to make it larger for better viewing. Have you ever used Sticky Back Canvas? I am totally in love with it!!! It allows you to use pictures, paper or what ever you would like to give a fabric like surface to the appearance. And it is so easy. Watch the video above for easy instructions from Claudine Hellmuth! Marianne and Nellie's Choice has many of these vintage sheets available that I can order for you. Some are in Sepia colors and others are colored. They work beautifully on Sticky Back Canvas. Joan, I remember doing this, a long time ago. So Nice that you have the video for help. Beautiful card!! I didn't know that the adhesive on sticky back canvas was strong enough to do this. So cool. 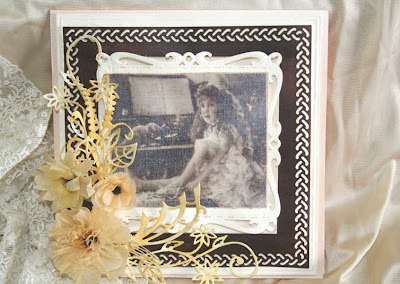 Really like this, your card is very shabby chic, a fine job, love the vintage sheet you used. I think I may want to get some in the Sepia, got any there? Love it! Your card is amazing! In the video she mentioned lazer jet print but can you also do this with ink jet print?